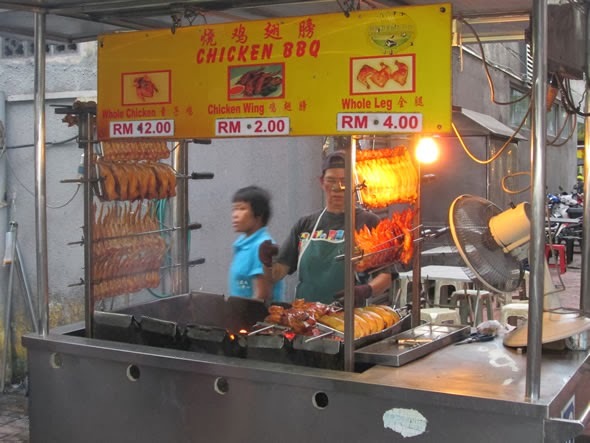 "I would love it if you could write another post on your thoughts about what you mention "the intention of the hybrid regime to turn a few hawker centres to be managed by non-profit organizations or cooperatives is sinister." What do you think will happen if truly this vile govt go ahead with this plan?" This blogpost is in response to the question above on 2nd Feb by someone. Answer is simple: PAP (hybrid regime)= Pay & Pay. Not only is the hybrid regime bankrupt of goodwill, it is in large deficits(goodwill) after countless attempts to extract more $$$ from the population. The latest example is the public transport fare hike despite degrading service & infrastructure. How can people trust the hybrid regime when its fake workers union chain of supermarkets sell most items at higher price than privately run Sheng Siong? 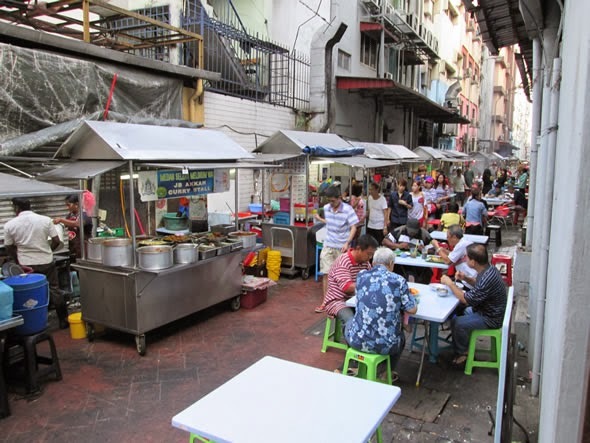 It is a kickstarter plan & is likely more hawker centres would be turned over eventually. We already have enough of those spam businesses. Mom & pop businesses with individuality are dwindling. Aren't you sick of the countless MCDs, KFCs, Starbucks, Breadtalk etc spamming over this tiny island? I've blogged last year that American Vice President Visit Hawker Centre - Tourist Attraction. He didn't visit a food court staffed by 'zombie workers'. Furthermore he made an impromptu visit because he know the hybrid regime's porlumpars(asslickers) would bring him to 'Potemkin Village' in S'pore with those fake acting. A wise leader he is to seek out the authentic. Current system of running hawker centres is good enough since an american vice president is attracted to it. If hawker centres are turned over to outside entity/corpseration, it is likely that individuality would be suppressed/eliminated. Hawkers would be told to wear standardised uniforms, cutlery standardised, signboards standardised. In other words is turning people into cog labor. How happy is cog labor? We've already seen the report that sinkies are unhappiest in world. Resort World Sentosa casino managed by Malaysian Genting group understands the allure of hawker food- they have Malaysian Hawker Food Street. They try to recreate the hawker scene though is kinda fake. However SG's hybrid regime don't understand it. Instead of hawker centres we see the rise of spam chains like Kopitiam, Koufu & foodcourts etc selling overpriced food cooked by 'zombies'. American vice president gets an emotional bonus buying from mom & pop hawker. There's no emotional bonus from 'zombie workers' in spam chains despite paying a higher food price. More stupidity is paying for some aircon & a huge premium to the bloodsucking landlords. Street hawkers at Meldrum Street at JB, Malaysia. Lots of individuality! No corpseration feel of a spam chain business. There's community feeling when eating there. Food stall hawker will ask you if you want to buy a drink from the neighboring drink stall. In return, the drink stall hawker will help clear tables during peak periods. They help each other. Such emotional bonus exist in Sillypore? In Sillypore, each hawker mind his/her own business. Super fresh. 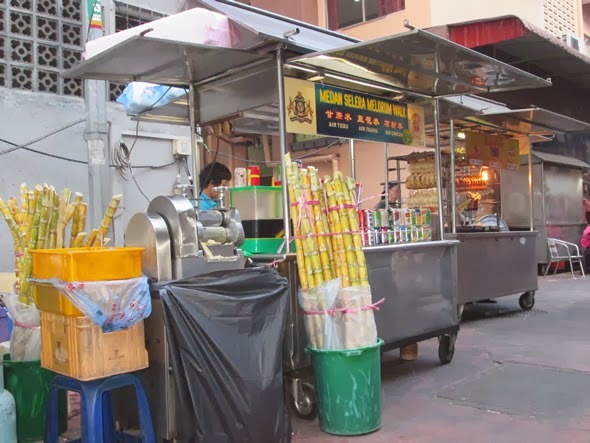 Squeeze the sugarcane juice right in front of you! Organic! No worker uniforms! Individualistic hawkers! I buy from hawkers i know i'm benefiting them directly instead of those bloodthirsty spam chain businesses/landlords. BBQ by charcoal! That's authentic. Look at the prices, which is why Kopitiam at Kranji MRT - Fools eat there. I may have strayed off the topic a bit using hawkers at JB. However in Penang, many tourists think more about the hawker food there than its tourists attractions which again proved why American Vice President had an impromptu visit to hawker centre in SG. Hence is best to leave the hawkers as it is in SG with low rents & govt overseeing cleanliness. We don't need more 'corpserations' or 'corpse' workers.